The world of haute couture is a place where only a privileged few can ever hope to reside, right? Wrong. 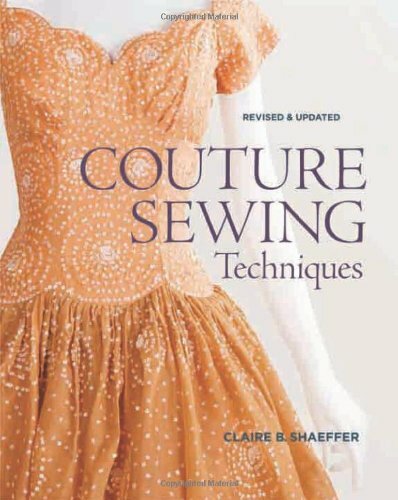 Fashion historian Claire B. Shaeffer opened the door to this exclusive realm in her authoritative guide to the techniques that define couture sewing. And now, the industry bible, Couture Sewing Techniques, has been revised and updated throughout — with new photos and a chapter on specialty fabrics. No one can unravel couture garment construction the way Schaeffer can, from the art of hand sewing to mastering edge finishes, from classic closures to shaping a garment for a perfect fit. Readers learn all the basics — and more importantly: how to apply the techniques — on skirts and sleeves, pockets and jackets, evening gowns, and more. Gorgeous photos, clear illustrations, and concise language combine to make this the most complete couture-sewing course available. She’s the Master I teach all levels of sewing at a comm. college and would recomend this book to my intermediate and higher skilled students. When you are ready to pay more attention and time to details, this book is for you.